Nuovi Megas box art. Very similar to all the other Nuovi Micronauti. The box is the heavier corrugated cardboard as was used in the Inter-Changeables line and is the larger box with a plastic tray. 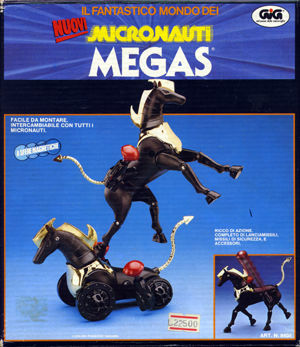 All the parts reside in the tray rather than underneath as was the case with traditional steeds like Oberon, etc. For more in-depth analysis of the differences between Nuovi Megas and the regular Megas, check out the Interesting Pieces section.